Are your cosmetics products toxic? While we can not control some major factors – environment, laws for toxic ingredients, etc, we can definitely control what products we use in our homes – what we wash our hair with, what soap we use, what lipstick and mascara goes on our face, and what sunscreen is not filled with a bunch of harmful chemicals. Bad news: You are surrounded by crappy products full of toxic ingredients that might influence your health daily. Good news: You are in charge of what you put on your skin, hair, nails, and what you breathe in and out. What are the consequences of using toxic products? Not every company is green and cruelty-free…if you care. It took me quite a few years to figure this out. Learning about food and the best ingredients for my optimal health was important… but once I cleaned up that part, I started craving more health and wellness in all areas of my life. I started looking at my household goods first, but it was so overwhelming that I stopped using everything and switched to the minimum of using baking soda + apple cider vinegar. When it came to shampoos, lotions, and any products for my face and makeup…I felt so lost. Is this a good product? Is it toxic? Who wants to read 99 ingredients on the label and research them all? The second problem I had with natural skin care and makeup, was that I was demanding. I believe in the quality of things and I would rather spend more on good products that save money and toss stuff that frustrates me. Sounds like you? Parabens – (crazy words starting with propyl-, methyl-, isobutyl-, and others) are hormone-disrupting substances. You can find them in shampoos, body and facial washes, lotions, and other products. Phthalates DBP, DEHP, DEP and other alphabet soup ingredients are the bad boys that disrupt your endocrine system and found in hairspray, nail polish, fragrances and such. Fragrances can cause reproductive issues and are found in so many products! Basically, it is synthetic fragrances that are derived from petrochemicals. You really don’t need them on your skin, our largest organ! Lead – Chances are, your lipstick has it. BHT and BHA. They are found in lipstick, mascaras, and other items. These are synthetic “preservatives” to prolong the shelf life. These substances can cause liver damage and hormonal disruption. Formaldehyde – a known carcinogen that is also linked to asthma, neurotoxicity, and developmental toxicity. Found in shampoo and other cleansing products. Sodium Lauryl Sulfate and Sodium Laureth Sulfate are allergens and skin irritation triggering substances found in shampoo, face and body wash and lotions. I can continue for a long time but these are the harshest and most used items. I truly hope I don’t need to tell you that conventional deodorant has aluminum that may increase the risk of breast cancer. Toss it and get a good one! Learn. Do your research. Because the government is yet to implement new laws regarding these substances – it takes them some time to catch up on research (if ever). But you can make better choices today by educating yourself. Check EWG – their database for cosmetics and other products. You can download their Healthy Living app and look cool scanning barcodes at Ulta (good luck finding anything clean there but probably, semi-decent Tarte hehe). DIY – it is not that hard, and investing in well-sourced ingredients + making your own stuff will make you feel safe and secure. Tallow – in the purest form – that’s what they use for their body butter, facial moisturizers and chapstick. Their products smell divine, never leave any residue, and, most importantly, last a long time! 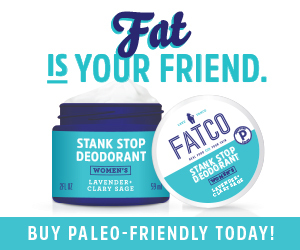 Fat stick and deodorant are my top 2 favorites! First of all, I love how passionate and determined this company is about clean cosmetics. I am sure with their efforts, we are going to have more regulations passed to get rid of toxic ingredients in our makeup and cosmetics! Secondly, the community is amazing! My favorite products? Charcoal Bar + Countermatch facial lotion. BTW, their makeup lines are used by pro make-up artists in LA, the mecca of all high-quality fancy things. I am in love with everything about this brand. The smells, the quality of ingredients, the people behind the brand – everything! My favorite is jasmine body oil and their Moonfruit night treatment (it is phenomenal!). This brand uses 100%. natural skincare products made with the nourishing ingredients on the planet! Their texturizing dry shampoo is da bomb! I love their mascara, concealer, and brightener stick! This brand keeps their prices in a very affordable range, and the variety of products + their quality is amazing! Innersense Organics. I love to shop for other products at Thrive Market and Safe & Chic. If you discovered the power of clean eating and happy movement…it’s time to work on other dimensions of your healthier life! Tell me about your makeup and cosmetics – what do you use daily? Thanks for sharing this list. I am actually shopping for a healthy cleanser right now, so this is very helpful!